My friend Ms. V and I dine at Paris Delice on a busy late afternoon, just after office hours. The restaurant is situated in a busy area somewhere in Makati Avenue where there are lots of restaurants and fast-food chains. 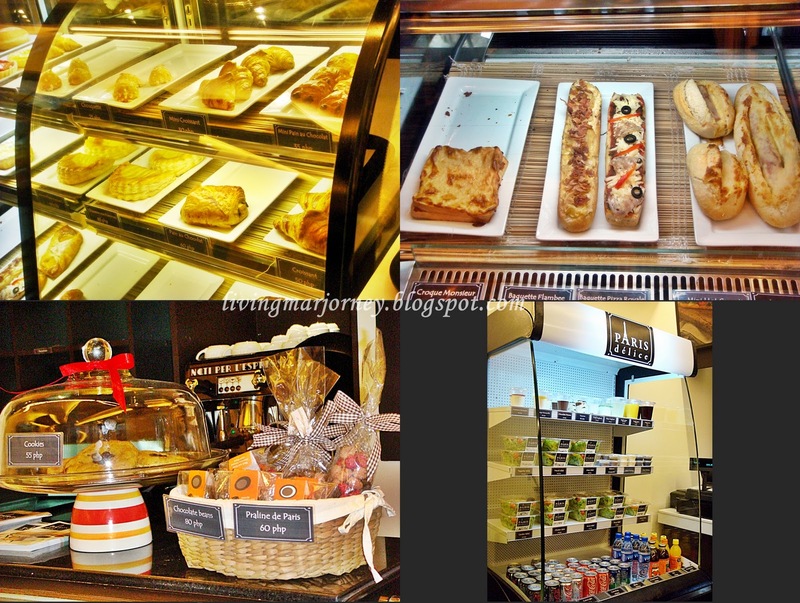 Just beside a popular Filipino fast-food is this classy French restaurant that offers breads and pastries made in France. I got fascinated with the interiors, French touch fast food? Fast-food because you'll have your order in just few minutes at a very affordable price. With a comfortable chairs and tables, quiet and relaxing ambiance to dine-in, wifi available to keep your status updated, " relaxing and enjoying my cup of Coffee and Quiches here in Paris" ; best of all, it offers freshly baked healthy sandwiches all at reasonable prices, Paris Délice is an example of a modern, classy fast-food restaurant. French bread, pastries, sandwiches, quiches and salads - all healthy, all at reasonable prices. All breads & pastries imported from Paris. We haven't decided what to have for dine-in and just noticed ourselves quickly ordering what to bring home. After placing our order we found ourselves sitting on their comfortable chairs and enjoying the atmosphere. 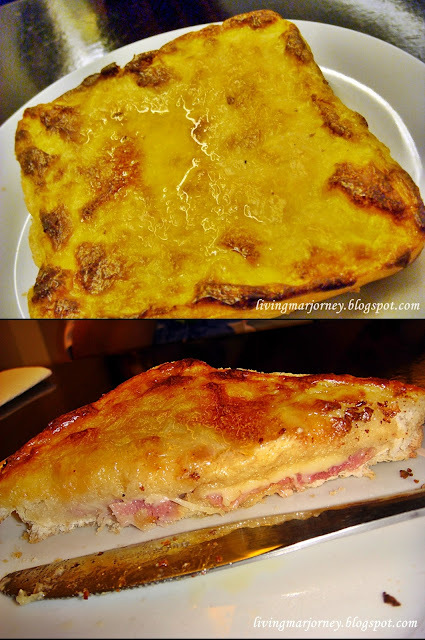 Croque Monsieur (p115), Grilled Ham and Cheese - the name sounds interesting! At first look, I thought it was just an ordinary tasty bread with the usual ham and cheese inside but I just smile to myself because I started to love it on my first bite, very flavorful and tasty. A hot dish with cheese and butter on top, melted cheese and ham inside. A must try again and again! I love cake & it's always present on every desserts I ordered. With my excitement, I almost forgot to take a photo and immediately cut a bite size of this Banana Chocolate Cake (p55). It 's heavy, a slice made me full! It's not too sweet having the chocolate cream on the sides. Triangle aux Amandes (p85) - fresh, flaky pastry with rich creamy almond filling. Compared to other Almond Pastry from other bakeshops that usually has bits of Almonds, Triange aux Amandes has rich heavenly almond filling. This is another authentic pastry from France. Pain au Chocolat (p60) - Tempting! I love the chocolate inside. Aside from breads and pastries, Paris Delice also serves Hot Dishes and Soup, Cookies, Hot/Iced Drinks & Coffee. Desserts, Soda, other beverages and Fresh Salads in this counter. Capping the evening, we had another Pain au Chocolat for take out. My friend ordered Hawaiian Sandwich (with Forest Ham, Emmental cheese, mayonnaise and pineapples ). She said " super yummy Ham Sandwich with tasty ham, melted cheese in crispy delicious French Bread. "